Bob the reading rooster. This photo has not been touched or retouched. This story is real. 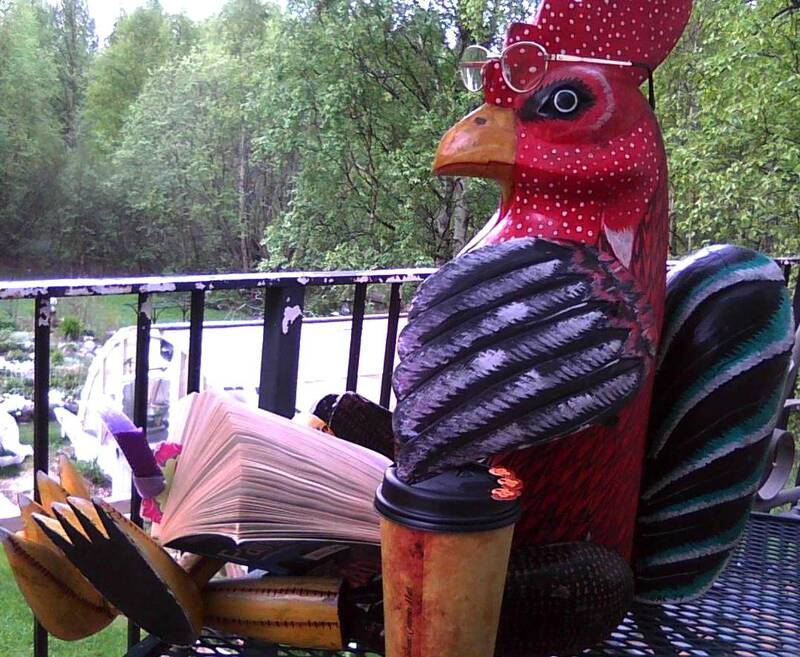 The first Monday reader photo for our first weekly feature, The Reader Place, is Bob the rooster. Bob came into my life just when I needed a good friend. I was in Alaska for 4 months last summer, because my mother had an accident that left her unable to care for herself. I was there for mom and Bob was there for me. I had briefly met Bob the February before, when my family gathered to mourn the loss of my sister. Bob and I bonded over our grief out on the cold porch, while I smoked and cried. (He was not allowed to smoke due to his burnable nature) I kept us both warm with blankets, and occasionally, Mom’s 100 lb Rotty mix, Sophie. When I returned in May, Bob rejoiced. His was a solitary life spent sitting on the deck that overlooks a busy road, waving at all the passersby. That’s why I taught Bob to read; he needed a diversion from his lackluster days on the deck. Next thing I knew he was stealing my mocha’s and my books. People came to visit and he would pull every conversation over to the book he was reading. I’d created a monster! The final straw was when I caught him as you see in the picture; he has my reading glasses (Bob has perfect eyes! ), the mocha that sis Laura brought by for me, and my latest murder mystery. We finally agreed on some ground rules. Bob got his own library card, reading glasses and an empty mocha cup, since with Bob, it was all about image. He meets with a readers group every week to discuss his books and him and Mr. I.V. Poley text each other often. That’s enough about Bob, let’s move on to the next photo. 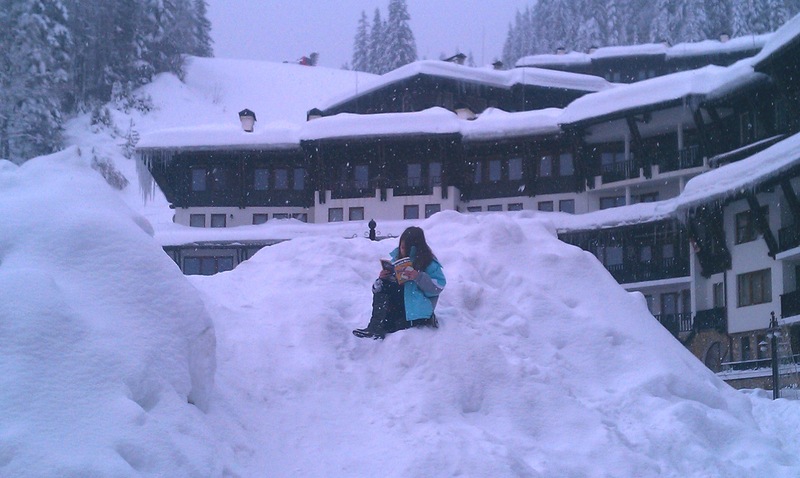 Hope on a snow mound for her school reading challenge in Bulgaria. Mom Nicola says, “Here’s the pic, as promised. My nine year old (Hope) did it for her school, as they were having a reading challenge of the most interesting place to be snapped whilst reading. It is taken in Pamporovo, Bulgaria. A very creative young lady. Look at that snow falling! Oh, Bob just wrote in to say he’s seen the snow in Alaska all the way up to his deck! Bob has attention issues, excuse him everyone. Thank you Hope & Nicola, and make sure you all stop by Nicola’s WP blog. Next photo, please. Another reader in our family. I love the picture of a window on the wall. How can he read that tiny thing? He doesn’t even have glasses on. He MUST need them, he IS five months older than me:>) Is this staged or not? 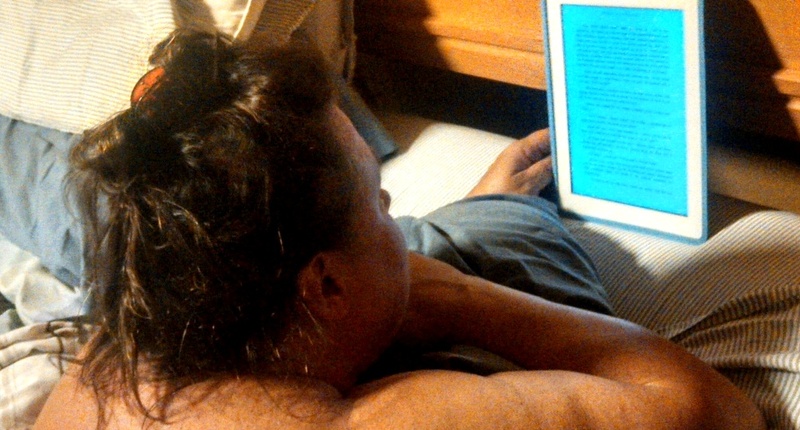 Cousin Elizabeth reading in bed. Looking cozy, Cuz! I think I’m going to save the comments that people sent in for next Monday, I bet you’d all agree that Hope wins for most unusual, Bob wins the mascot award and my cousins get the loyalty award. Thank you all for participating and please keep sending them in! 1writeplacewordpress at gmail dot com I need them by Sunday. Add a link if you have a business or book you want us to visit. Categories: BLOG TALK, Phall Photos | Tags: books, reading | Permalink. You just gotta find happiness where you can! 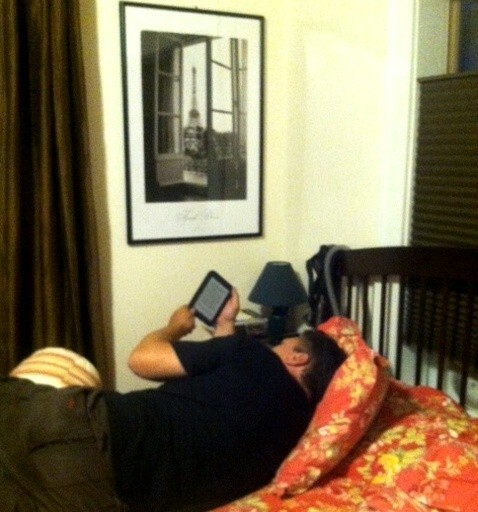 Thanks for stopping by & I’d love you to send in a reading photo. Love it. Is it a coincidence that Patches the Bear has stolen my reading glasses, and the mice are giggling as he reads to them and Shtinky the Skunk? Would love a photo of that scene! Thanks for all your comments here…glad to have you in this little community.